Keeps Supply Chain Obligations on Track and on Time. 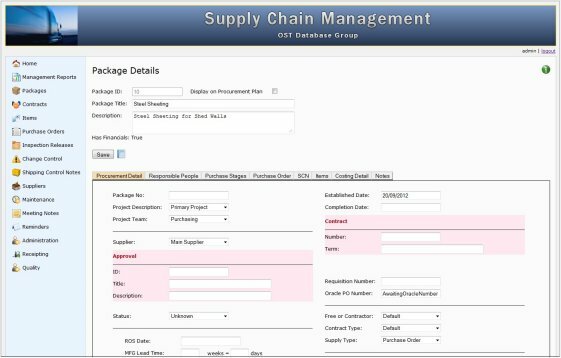 Workflow Essentials - Supply Chain Management assists with a broad spectra of procurement management processes - high level control of purchase packages and contracts, purchase ordering, as well as the fine point management required to keep expediting and logistics on track and on time. Supporting access to current and live data by multiple personnel at the one time. Bolstering project and procurement management processes. Standardizing processes, procedures and documentation including management reporting. Optimising reaction time to project events. Reducing detrimental risk management events. Setting up procurement packages and/or contracts, and tracking these through pre-set stages. Linking a range of personnel such as principle expeditor and logistics officer, buyer, etc. Adding and tracking purchasing orders against these packages, linking in purchase lines from a catalogue of standard items. Entering and tracking logistic details - shipping units, multiple voyage legs, purchased item details (size, weight, etc) and critical pickup and drop off points. Potentially link with a current financial system. Export data to MS Excel and other file formats for further analysis and /or import into another system. Import data from a third party system. Include additional analysis functionality and detailed statistical reporting. Present specific management reporting with embedded graphs. Microsoft Windows Server 2003 or 2008 with IIS Server. Microsoft ASP.Net 4.x with AJAX extensions. Most current web browsers - Microsoft's Internet Explorer, Mozilla's Firefox, Google Chrome, Apple Safari with Java Script enabled.